Po 359 - Расистских убийц - к ответу! Martin Luther King Jr.
English Title: The Racist Assassins Must Pay for Their Crimes! Powerful Russian poster created in 1968. 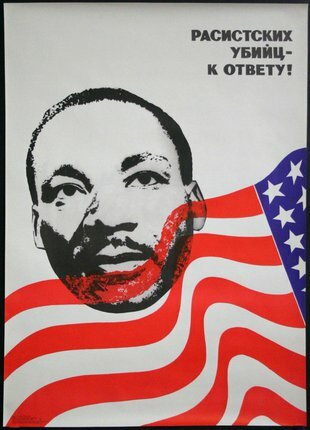 Though seemingly pro-American with the US flag behind the face of Dr.Martin Luther King Jr., the Russian text (roughly translated: "Racist Assassins Responsible") is actually a harsh criticism of 1960's American politics and racism in the US. For more Russian Political & Film Posters use our search function.